It's a real contender to the family SUV's! Before SUVs became the popular shape for family cars, wagons like the Subaru Levorg would have been the go-to shape of family vehicles. 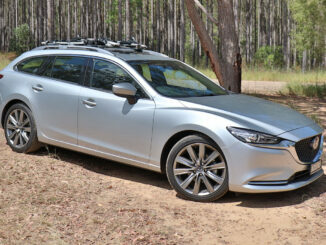 Can this sporty family wagon still compete? BabyDrive put it through it's paces to find out just how BabyDrive friendly it still is! Aesthetically the Levorg is a good looking and sporty car! 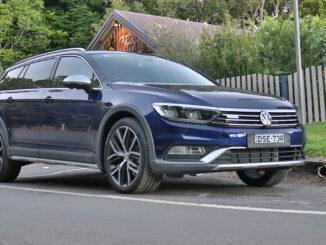 It should be a real contender to the current trend of SUVs as family cars. I found it really comfortable, easy and very enjoyable to drive around town and very stable and fun out on open country roads and excellent on bends! There was a little noise on rougher roads but other than that it was relatively smooth and quiet. I tested the new model but apparently models pre-August 2017 were incredibly bumpy and noisy so make sure you check out the date of yours but presumably it's so different you would definitely tell! The Levorg felt both practical for loading up with kids and family equipment as well as a lot of fun for me to drive when out on my own!!! The boot space is whopping! Definitely ample for a family's day to day activities as well as loading up with all the gear for holidays and family road trips. It will hold 14 shopping bags when empty! I also loved I could get a basic stroller right up against the back seat rests and still fit 10 shopping bags or a very large dog! Interior space especially legroom is extremely good. We could comfortably travel with a 184cm adult in the front passenger seat with a rear-facing child seat behind! Fitting child seats in the back I found simple, there are three top tether points and ISO Fix in the two outer rear seats. I could easily fit two child seats in the outer seats and although there is a top tether point for the central seat, the rear seats are not wide enough to fit a child seat in the central one too. I found the Levorg easy to park and manoeuvre, visibility and comfort are very good for the driver and as a passenger. There are a few little details I would LOVE to be able to tweak to make this a PERFECT BabyDrive wagon! The cup holders could be a little more usable in their size and depth so it was easier to pick up my hot drinks without losing their lids thus spilling the contents! The door bins could be slightly bigger to hold larger re-fillable water bottles. The ceiling handles in the back could be positioned slightly better to hold a child’s toy in a better position, the map pockets in the back could be slightly deeper to conceal an iPad (they should be renamed to tablet pockets!) and the media system needs Apple CarPlay and Android Auto as the current system is very basic and confusing to navigate. The back seats are very comfortable and recline but this causes a problem with the boot cover as it needs to allow for this movement. Subaru solved it using a retractable blind on the main section and a strange second piece that wedges against the sides of the boot with rubber stoppers! This was just constantly knocking off, falling down and irritating me! Other than these points there is nothing that stands out with this vehicle as being inadequate or wanting to change. This is a fantastic vehicle as a BabyDrive in terms of size, drive and practicality, it is just these fixtures and cosmetic things I would like to change to make the Subaru Levorg the perfect BabyDrive wagon! The Levorg scored a five-star ANCAP safety rating in 2016. 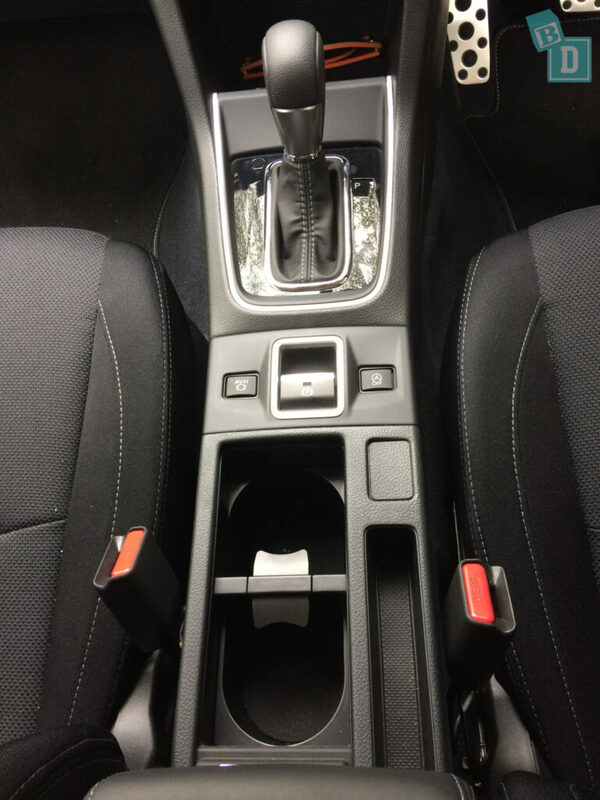 There are two cupholders in the front of the Levorg in the central console, between the two front seats. You have to play around with the holders to work out what they will best fit for you. I found the rear of the two is shallower than the front, making it better for holding coffee cups. The front one it is too deep, making it hard to pick your cup out once it is in there and I found the lids came off and spilt my hot caffeine fix everywhere! 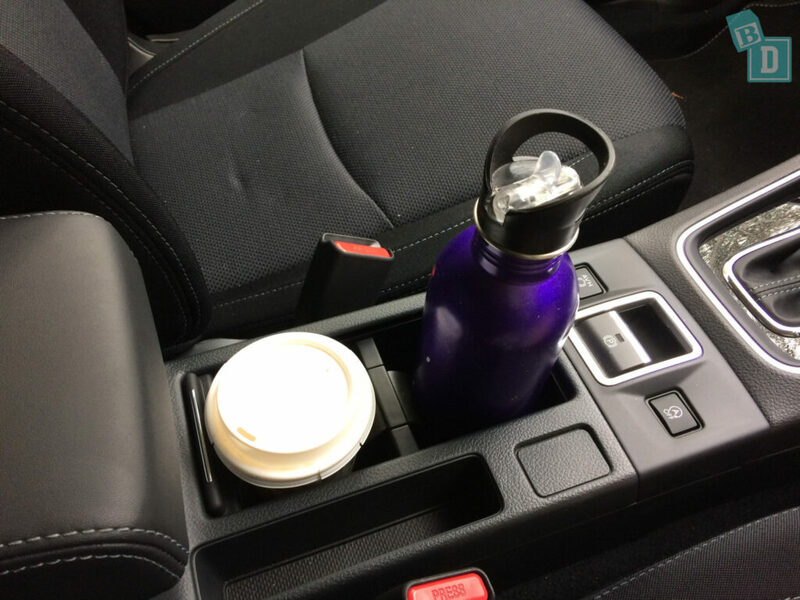 A 600ml water bottle or baby bottle rattled around in both cupholders even though there are rubber flaps to help hold small vessels in place. A sippy cup fitted perfectly as did my travel mug and my very large refillable water bottle. I found similarly the door pockets were not well sized for drinks bottles. The obvious areas in them are too big for a 600ml water bottle, a Pigeon baby bottle just rattled around in there too and my large refillable water bottle is too big for the door pockets. None of the door pockets are lined so anything not held in place rattles around. I could fit a 600ml water bottle and the iPad in the door pocket, but the iPad was not a perfect fit as it stuck out at an angle towards the driver's knee. I found the narrow section of the door pocket the best place for a baby bottle or 600ml water bottle, as they fitted better and were held in position so they did not move around. 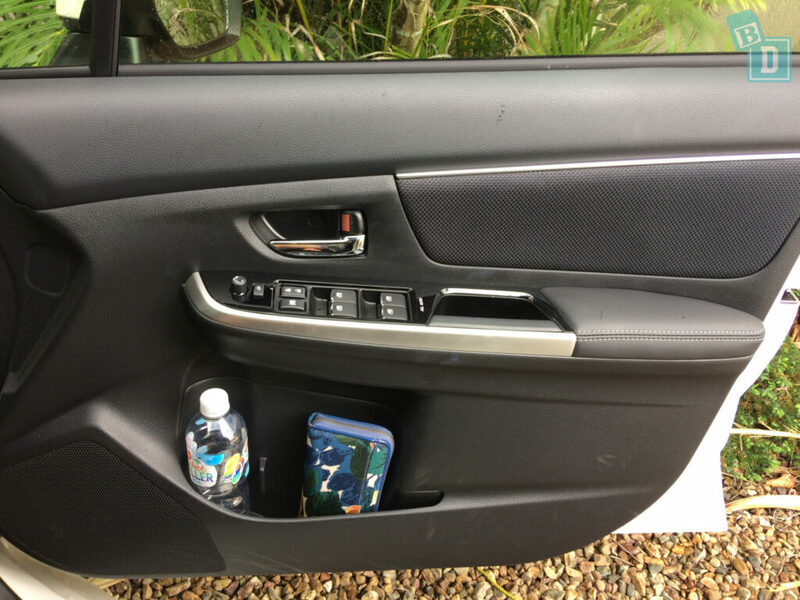 There are little wells in both the front and back car doors, which I find perfect for putting small things from babies hands or the keys in when putting baby in an out of the car. There is a small well, with a rubber grip lining, in front of the gear lever. There are two USB sockets, an AUX and 12V socket here too. I found this is a good area to put your phone whilst travelling because you can charge it. The central console storage box also has two USB sockets and a 12V socket. It has felt lining on the bottom so your phone would not slide around and two grooves so you could pass a USB wire in or out as well. 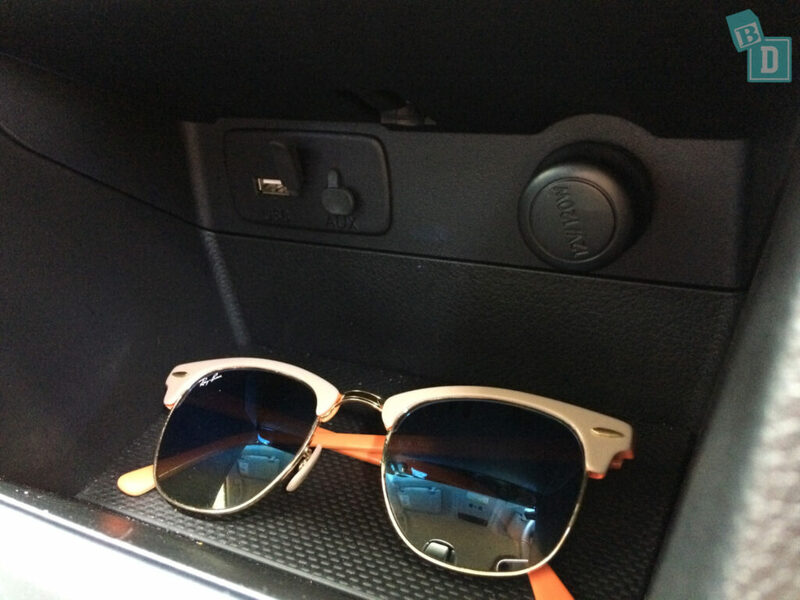 There is no glasses case in the ceiling of the Levorg, which drives me mad, so you need to allocate one of these two areas to your sunnies and the other your phone! The glovebox is not enormous. I could fit my iPad, wallet and keys in there with the manual but there was not much manoeuvre room due to the depth of the glovebox. 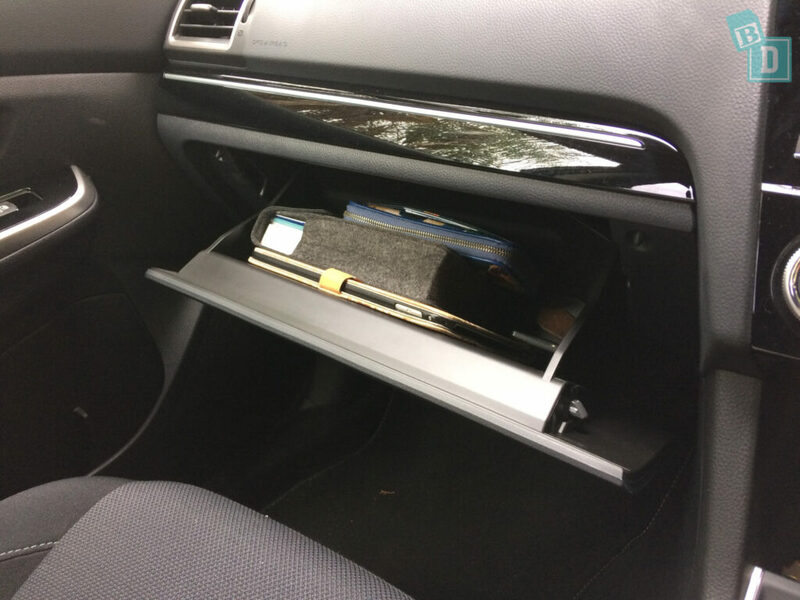 There is no hidden under seat storage in the front or back of the Levorg. 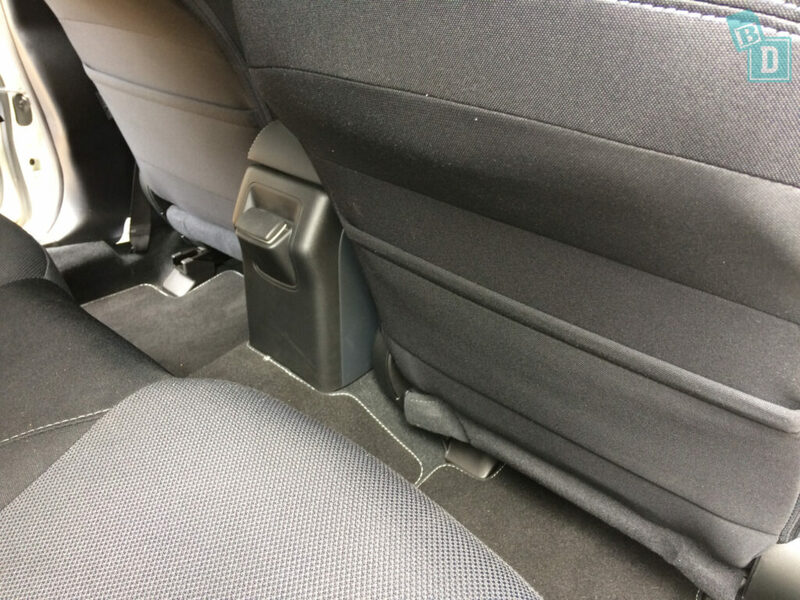 The map pockets in the back of the front seats will hold an iPad but are not deep enough to cover the top of the iPad so you can see the iPad is there. I find the map pockets the most convenient place to store an iPad, phone or DVD player that I pull out to appease my bub on particularly long journeys. Being able to store it away in there out of sight when we get out of the car is important to me. In the back two cupholders are situated in a fold down in the central seat back. Like the front ones, I found them odd in size. They would hold a disposable coffee cup and a sippy cup however a 600ml and Pigeon baby bottle both moved around in them and my large refillable bottle was too big. The door pockets in the back are smaller than in the front they would not fit an iPad or wallet. A 600ml or Pigeon baby bottle but both moved around and they are too small to hold my large refillable drink bottle. Moving to the boot, the Levorg held a whopping 14 shopping bags! Five across the back of the seats, six between the wheel arches and then three in front of the boot opening. This is an enormous boot capacity and a really practical and usable shaped space. The boot space and its functionality are really important. I like to have a big boot space and little side wells or areas I can divide things into. So something I don’t want to move around while I’m driving such as Tulsi’s lunch bag or her wet swimming gear can be sectioned off in a little well where it’s not going to spill or get squashed by the rest of the things in the boot. Hooks for securing shopping bags to are also favourites of mine, I like being able to secure the bag containing more fragile things like eggs so they don’t move around on the journey. 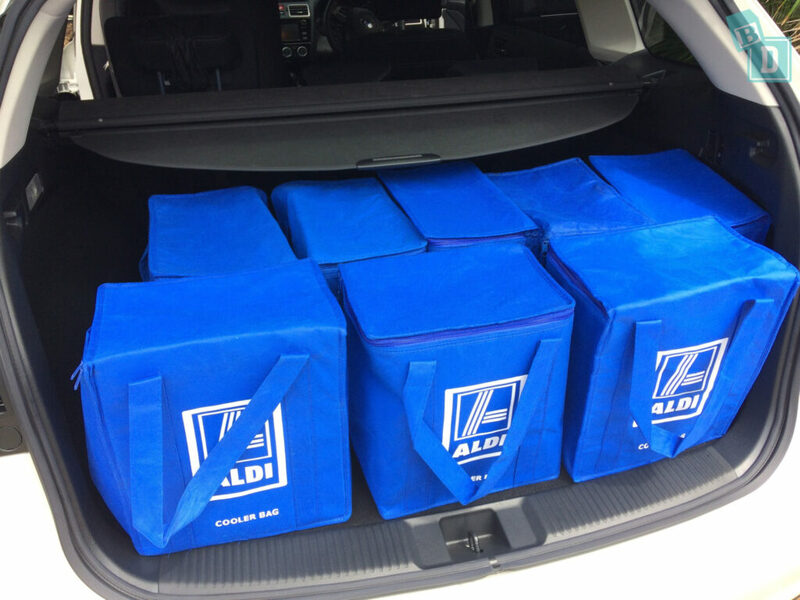 I measure the boot space in freezer shopping bags, prams and dogs. Not because I think all there is to a mum’s life is food shopping, prams and dogs. (Although it can feel like it sometimes!!) But because these are visually mesurable items we can all associate with. For me, the car company boot measurement of litres ia not an amount I can easily visualise and 400L in one car may differ in usability to that in another due to the configuration or shape of the space. 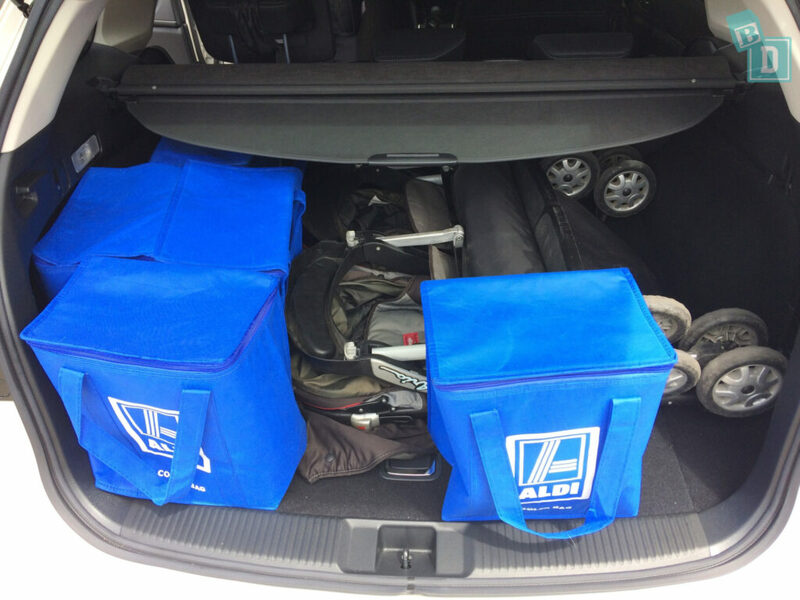 The double stroller fitted easily in the boot with five shopping bags. Four shopping bags to the side of it and one in front, and there was still a good space on top of the double stroller where you could put baby bags etc. I found the Mountain Buggy Urban Jungle stroller had to go widthways across the boot, as I could not shut the boot lid with it lengthways. You would need to check your pram fitted if you are concerned about having the flexibility of it fitting length or width ways. Widthways, there was still plenty of room around it for bag storage, I could get six shopping bags around it! 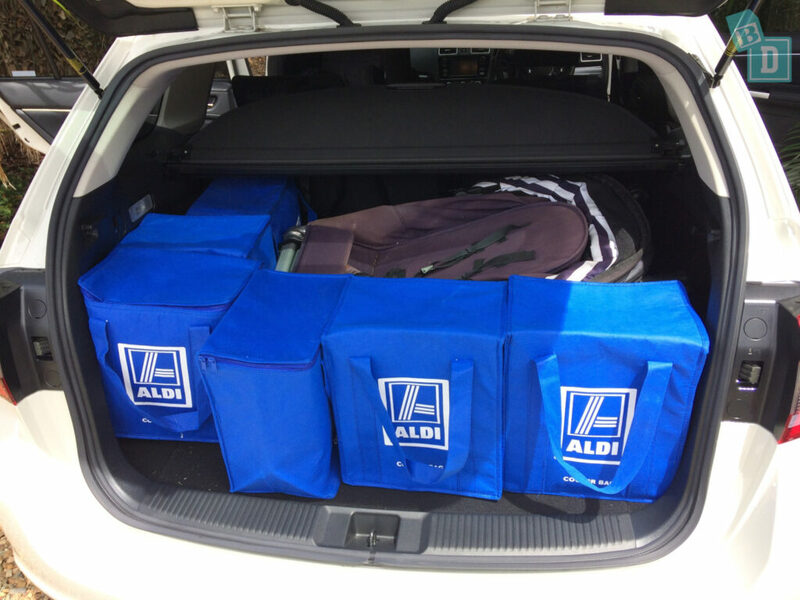 With the basic stroller across the back of the seats in the boot, you can put 10 shopping bags in front of it! 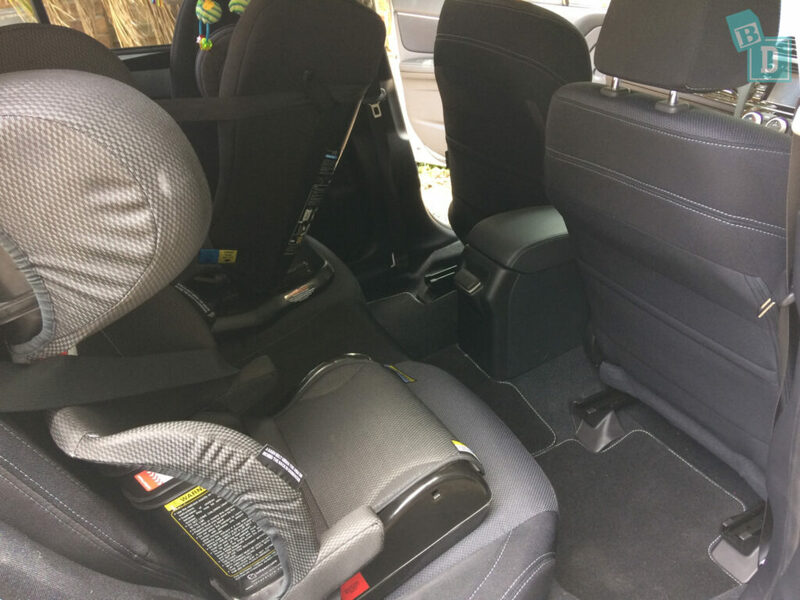 I found it fantastic that the stroller fits across the width of the back seats, between the wheel arches, so you can put it right out of the way and use the rest of the boot floor space for other things. 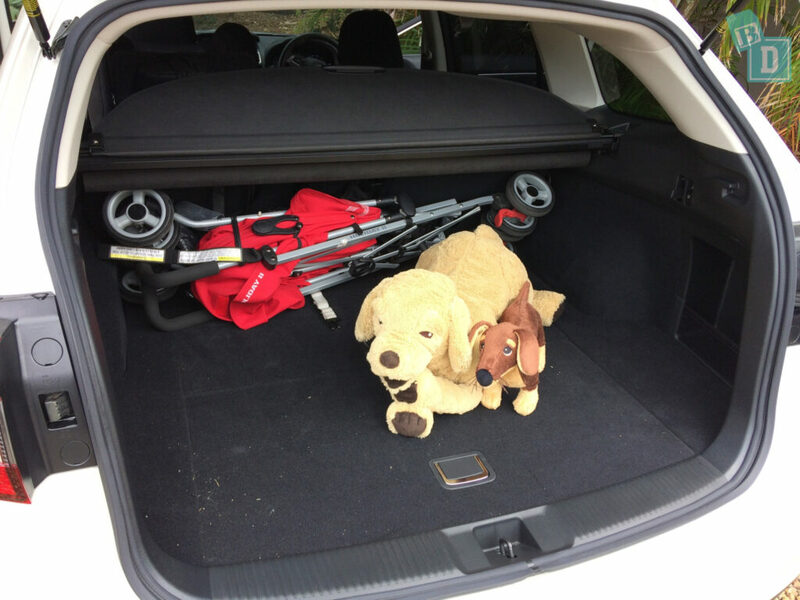 You will be able to get a nice big dog in the boot even with a basic stroller in there as well. Putting things in and out of the boot was really easy! The mouth of the boot is wide and open and the boot floor is flush with the edge of the boot so you can slide things in and out easily and it is not as high to lift things in and out of as the boot floor of an SUV making it is just as user-friendly if not more so. Baby can lie down in the boot for a nappy change! The floor is softly carpeted, flat and even, there is no lip preventing baby rolling out though so you need to be very careful. We have found large boots like this a great place for our little one to have some tummy time and a bit of a romp about when stopping for a break on a long journey, letting them stretch and use some energy before putting her back in her child seat. The boot has no power sockets, making running an Esky on a family outing tricky as you would have to run it from the central console box. There is a bag hook on either side of the boot alongside a button to press to fold forward the rear row of seats. There are four tie-down points in the boot for a cargo net or to strap things down with. On either side of the boot is a moulded recess which I love for storing drinks bottles and wet sandy items, shoes or suncream. Things that I do not want to roll around or spill all over the boot. 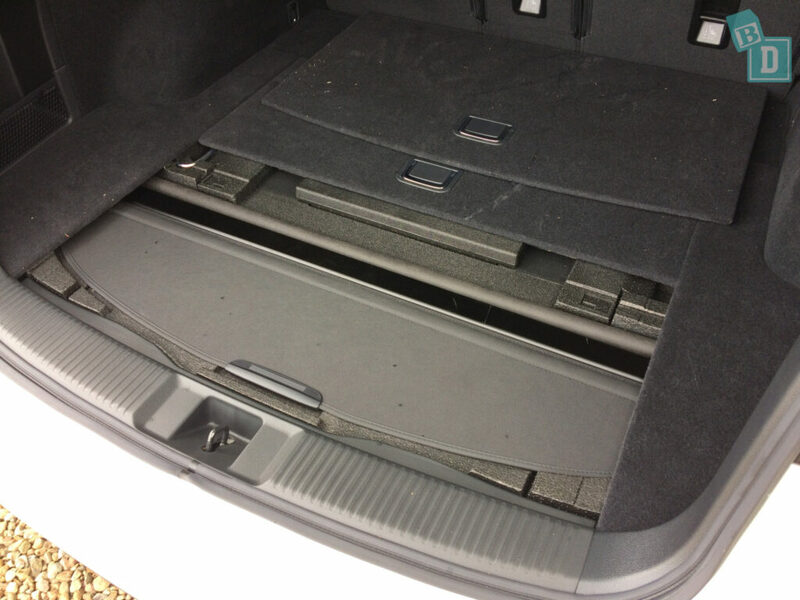 There is no hidden underfloor storage, although there are two handles in the boot floor which would suggest there is storage space underneath however there is not, it is for the retractable blind which is removable and then stored in the boot floor. The retractable cover for the boot is a bit of a joke! It consists of a removable beam which sits ¾ of the way back in the boot. 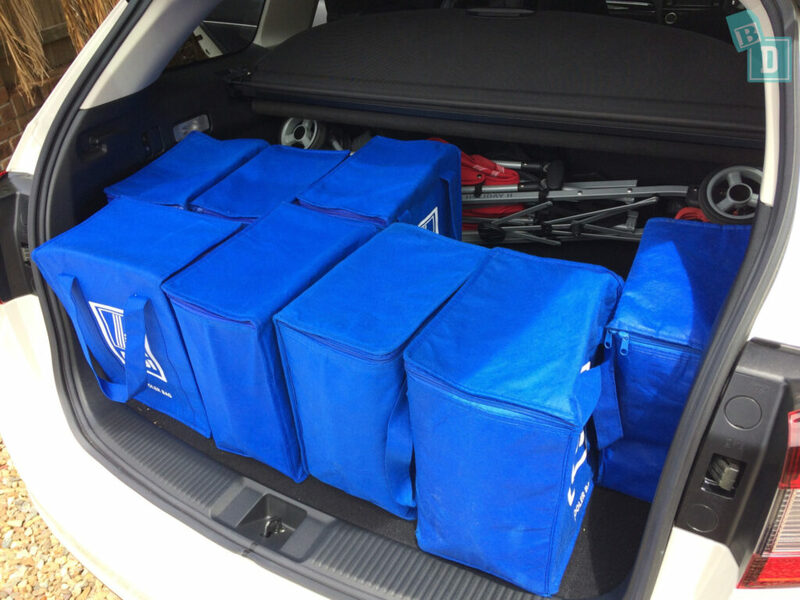 It has a large solid flap at the front which hangs down and gets in the way when loading the boot. To cover the remaining ¼ between the beam and the back seats is another piece of blind with a rod through the end of it which you wedge in place with the rubber stoppers on each end of the rod! What happens when going over big bumps, would it become dislodged? What happens in an accident if that comes easily dislodged and things fly out of the boot? I found this a precarious attachment method and although it is relatively simple to wedge into place it is very easily knocked out of place too! I also wonder about its longevity and surely overtime the rubber stoppers would get worn and therefore not hold it in place and it would end up just hanging down in the boot? I also couldn't reach to put it in place from the boot, so I had to do it from the back seats. There are no parking sensors in the Levorg, just a reversing camera. There is lane keep assist, which helps to keep you within the lines of the road, and lane departure warning in the Levorg, which alerts the driver with a sound. Although the warning has a relatively quiet beep, I found it very sensitive so it was constantly sounding. The button to turn this on/off is in the ceiling where the sunglasses holder usually is. You have to press the button for a long time for it to actually work, I thought there was a fault with the car as I could not get it to turn off no matter how many times I pressed it but was then told you have to press it for quite a few seconds for it to work! There were no options in the media screen to adjust the volume of its beep. Becoming a parent I soon realised there are some noises and sounds I feel are unnecessary and I could happily live without if it meant my baby stayed asleep!! That often the distraction of my screaming, distressed baby is more dangerous when driving than not having a lane departure warning for example. If it is the lane departure warning beeping that creates distress with my baby then which is safest? It’s where I think we need to be able to strike a balance and choose when we can mute the warnings or swap them to a vibration in the steering wheel or flashing light perhaps? A lot of these noises come with the increase in technology and especially linked to safety features and alerts. For me these all have their place. Another thing I have realised is I spend my time in a lot more places where small children roam, parks, beaches, play gyms, swimming lessons, daycare centre etc. I have become more aware that when I’m reversing or manouvering in the car parks I have to tripple check for small children running around behind me or being in my blind spot when reversing. For this I LOVE reversing cameras, I just don’t like their beeping sounds!! I have become so much more aware of safety and potential accidents or hazards since having a child and so I love the peace of mind that I get from the cameras and sensors combined with my own vision from windows and mirrors as I don’t trust cameras alone. The indicator noise is not too offensive; it is quite quiet and would not disturb a sleeping baby and its volume cannot be adjusted. In fact, I found no volume controls in the settings at all apart from turning the touch screen beep on or off. There is no Sat Nav in this model and no Apple CarPlay, so I just used Google Maps on my phone. I found the media system very difficult to navigate even though it's very basic. The windows are quite quiet to open but they close with a firm closing sound which could disturb a sleeping baby. The opening and closing of the doors were not too loud to disturb a sleeping baby either. With baby asleep you can get in and out without worrying the doors will be too noisy. The same for the windows their mechanism is not too noisy and I didn’t notice them having a loud opening or closing sound. With baby asleep you want to be able to get in and out without worrying the doors will be too noisy and wake Bub up! There is a display on the central dashboard showing you which seats have seatbelts on for the front passenger and the three rear. 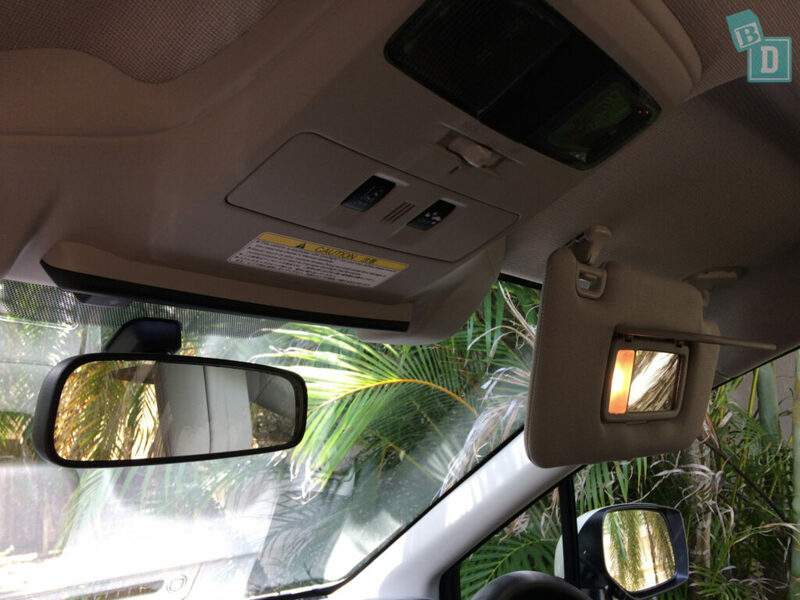 The driver can lock the doors and windows from the control panels in the door, they are not auto-locking. An alarm does not sound if the driver parks leaving the engine running, removes their seatbelt and opens the door to get out. Which is perfect for being able to park and get some fresh air when bub has fallen asleep. If you try to drive off without fastening the driver seat belt an alarm sounds to warn you. One of my favourite little sounds in the Levorg is a gentle reminder beep that sounds if the car in front of you pulls away and you do not! A gentle beeping and dash display alert you that the traffic in front has started moving! I loved this!! And the sound did not disturb my sleeping bub too! A great BabyDrive feature! The automatic engine cut out turns on and off gently when you stop at traffic lights in the Levorg. In fact, I didn't even notice the car turning off and on. Usually, there is a shuddering of the vehicle and a bit of engine noise but the Subaru was quiet and did not have a shuddering start. The switch to turn it off is in the central console but I found I didn't need to turn it off (the first time I have been able to say that about a vehicle). The road and the engine noise of the Levorg were not any problem either, there was no disturbing sounds or feelings that would upset any sleeping passengers. I could fit two child seats into the rear of the Levorg. 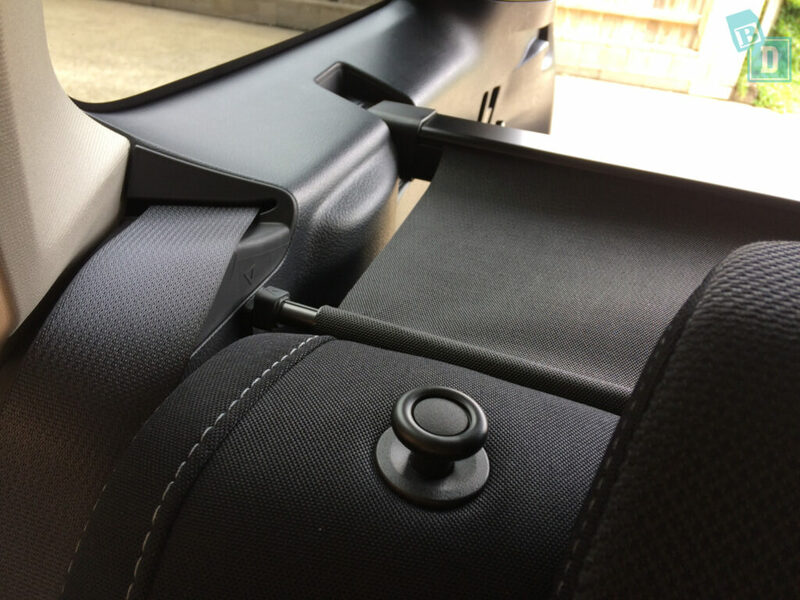 The ISOFix points in the two outer seats are easy to locate behind flaps in the seat covers and easy to connect to, as are the top tether anchor points located on the seat backs of all three rear seats. Fitting child seats to the two outside seats were relatively simple. The ISOFix anchor points are clearly labelled and concealed behind fabric loops which you move to the side and insert the ISOFix clips. I do have concern for the longevity of the fabric loops as well as the area around the ISOFix anchor points as it is crudely cut through the seats exposing all the seat padding etc with their raw edges. Over time I think these will wear quite badly, collect general detritus and the fabric perhaps fray. 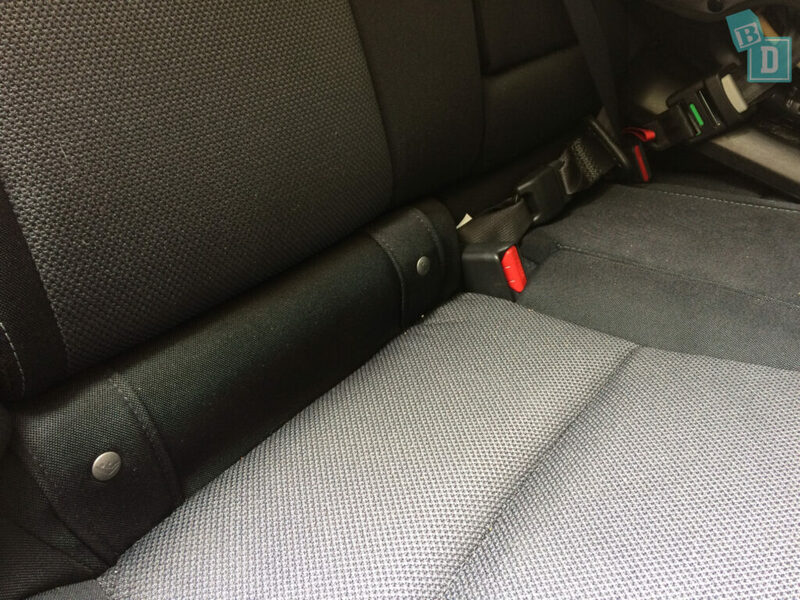 The rear row of seats come forward individually making it easy to bring seat backs forward to connect the top tether straps. I did fasten one from the boot, which was easy enough to do, but a little far to reach across its enormous boot! The seats in the model I drove are woven cloth which would be difficult to wipe clean and may collect dirt food etc that would be difficult to remove. 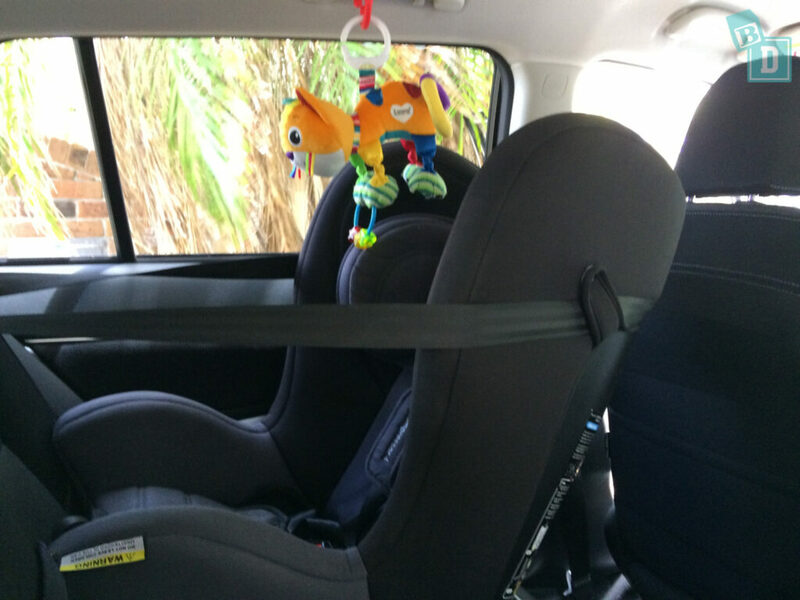 There is plenty of room to post baby into their child seat from both inside and outside the car. With one child seat installed there is plenty of room to breastfeed in the backseats. Australia being a country of weather extremes- blazing sun and torrential rain, mean you may find it easier to put Bub into their seat from inside the car sometimes. If it’s hot you can get the air-con going, cool the car down and not stand out in the sun while you fasten them in or shelter from the rain and not get soaked yourself whilst you’re doing it. So it is important to test whether Bub can be easily installed from either direction! The back seats are extremely comfortable. They have a simple handle on the edges to altar the angle of the backseats to a really nice recline. Sitting behind myself in the back there is a lot of legroom I am only 162cm but there is definitely legroom for a 184cm passenger at least to sit behind me driving. 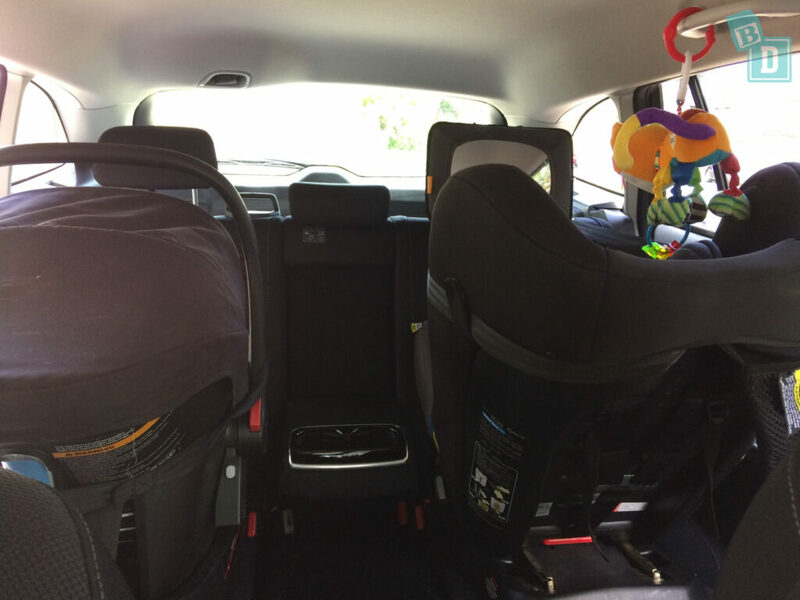 With a rear facing child seat installed in the back, the front passenger has 25cm of knee-room, that has to be a record amount space! The seats in the Levorg adjust manually. I have found them comfortable in both the front and back and very adjustable. Travelling in the back the outside seats have a lot of headroom and legroom. 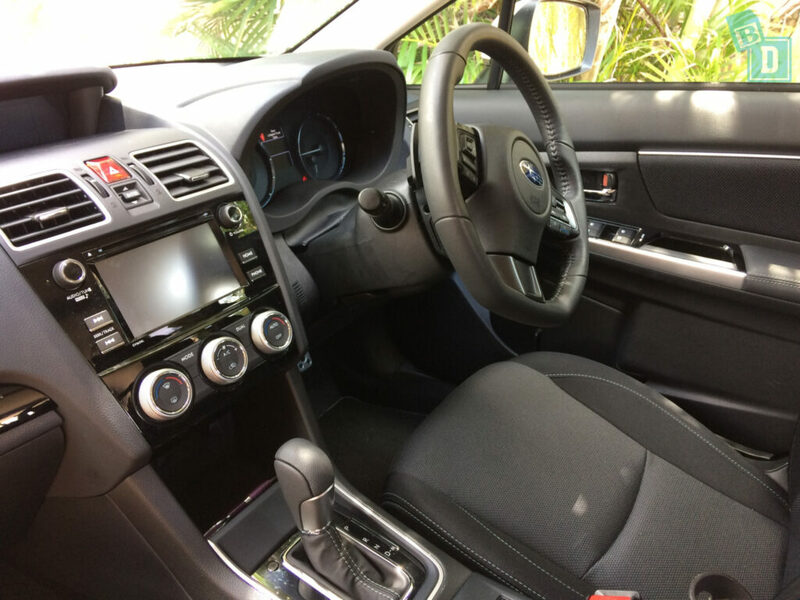 In the central seat, it is comfortable however you are slightly pressed up against the child seat and there is a hump in the footwell you have to straddle. You can adjust the angle of the back seat backrests split 60:40 with simple levers in the side of the seatbacks. The headrests in the front are extremely adjustable so you can definitely wear a ponytail!! I had spent hours styling my hair this morning to get this ponytail just right too… said no new mum ever!!! The steering wheel is fully adjustable up/down and in/out. The air conditioning in the Levorg is very effective. The auto setting cools the car quickly and is strong enough in my experience to cool the whole car which is good as there are no vents in the rear of this model. 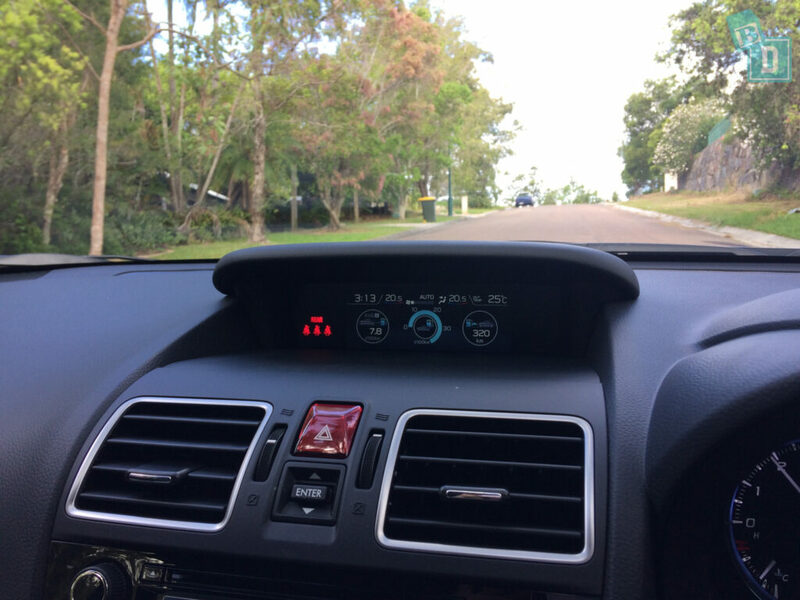 There are two vents centrally located on the dashboard and two in the outside edges of the dashboard although these vents are not enormous they have been adequate for cooling the car on a hot Queensland day while I have been test-driving it! The controls are three centrally located dials on the dashboard which are perfectly located simple and easy to adjust and use while driving. The windows have a very dark tint on this model and I have not needed to use attachable shades at all. The visibility in the Levorg is very good. Whilst manoeuvring, parking and driving for a long car I have found the visibility to be excellent and I was able to place the edges of the car which is good too especially parking. For both a rear facing or forward facing passenger in the back visibility is good and it does not feel claustrophobic in the back seats. In the front, there are lit vanity mirrors on both sides for the front passengers. The front interior lights are individual press on lights. In the back, the ceiling lights are positioned just behind the front seats and can be reached and switched on or off by the front passengers and mum while she is driving! I have found Tulsi does not like travelling in the dark in the car so if it gets dark whilst travelling then I reach back and turn the interior light on for her. So it’s really important for me that I can reach the rear ceiling light. Also if I am traveling home and it is getting near to bed time and I DEFINITELY DON’T want her to fall asleep in the car as even a 5minute nap in the car means bed time is all over!!!! I lean back and pop the light on so it’s not dark and try to keep her awake!! Along with screaming/singing at the top of my voice!!! It is also useful when there are lights situated above the doors where the handles are usually positioned. These are good for when putting baby into their child seats when visibility is poor, so you do not have to reach across them to a light situated in the ceiling centrally etc. The handles above the doors in the back are positioned a little too far forward in the car for a baby toy to hang. When I have hung a toy there it is too close to bubs head and needs to be a little further back to hang comfortably. 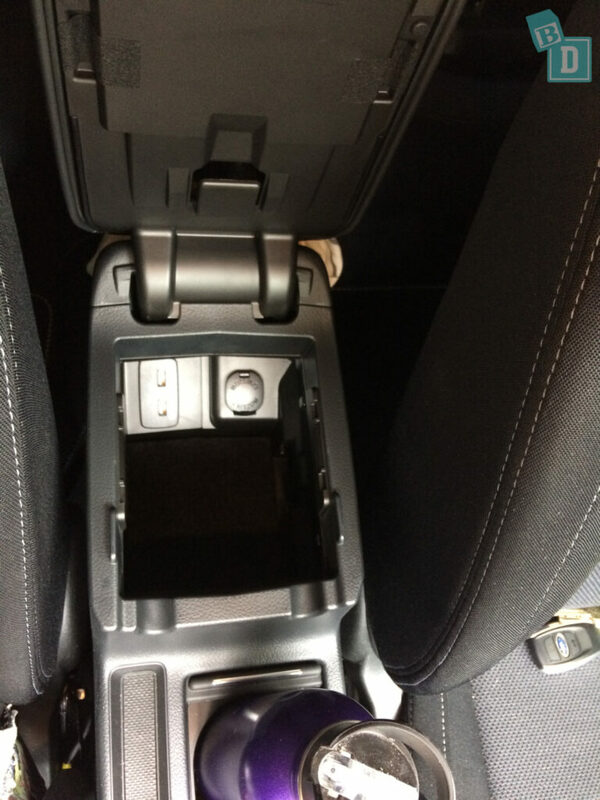 There is a 12V socket in the central console box and one in the well in front of the gear lever. There are matching floor mats in the front and back with contrast edge stitching. The doors are mainly wipe-cleanable surfaces but have the seat fabric as panels in them which would stop them area being able to be wiped clean. 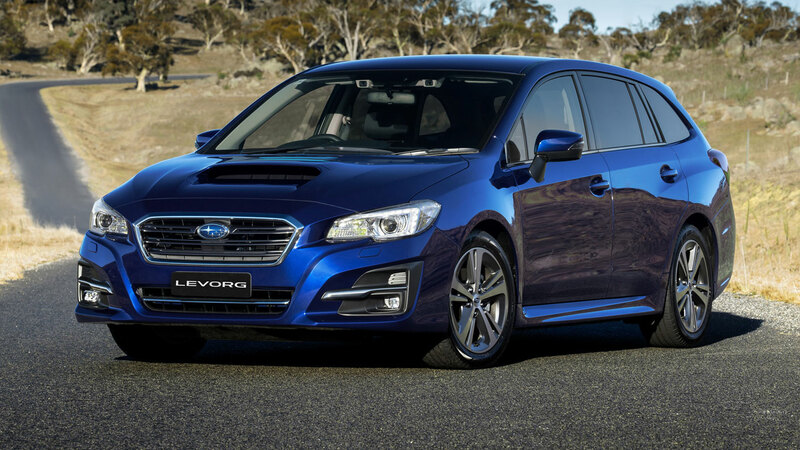 Ascetically the Levorg is a good looking, sporty and simple car! And should be a real contender to the obvious SUV family cars. It is easy and enjoyable to drive around town and very good out on open country roads and bends. I have found it easy to park and manoeuvre, while visibility and comfort is very good when driving and as a passenger. Models from pre-August 2017 may have a much harder, bumpier and noisier ride. It seems changes were made to models after this period to improve these things and we must have had one of the new models as I found it fine! Boot space and interior space especially legroom is extremely good. Apart from the odd boot cover connection, media system being basic and confusing to navigate, there is nothing that stands out with this vehicle as being inadequate or wanting to change. 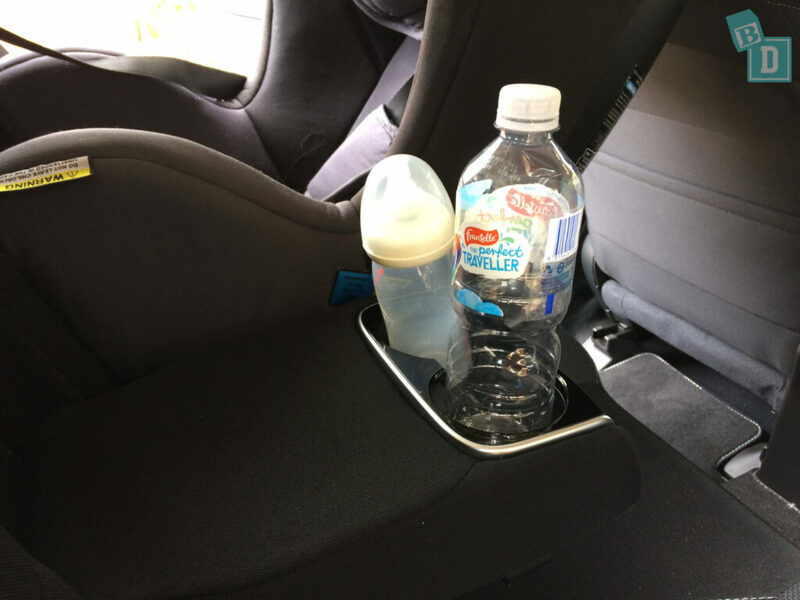 You cannot fit a third child seat and I found the cup holders odd sizes but other than that this it is a fantastic vehicle as a BabyDrive and family car. The cruise control in the Subaru Levorg is actually quite good at holding accuracy on undulating roads and at low speeds. 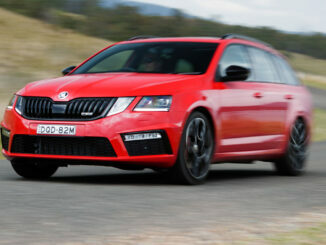 It tends to stay within 5km/h either side of the selected speed, on undulating roads, which I think is quite good. The controls are easy to use on the right-hand side of the steering wheel and are relatively simple and easy to navigate. Connecting the car's Bluetooth to my phone was simple enough although I found the media system a little bit difficult to work out, even though it is very basic. The calls I made were quite clear. The speakers are quite clear and listening to podcasts on them was good sound quality and relatively easy however I found it best to control everything from my phone rather than the screen. The Subaru Levorg scored a five-star ANCAP safety rating in 2016. All models come with seven airbags, front and side airbags for the two front passengers and a knee airbag for the driver. Also side curtain-style airbags run the length of the car to protect all passengers from side impacts, these use a whiplash reducing design, which provides extra support for passengers’ head, neck and torso. The Levorg uses Subaru's EyeSight Driver Assist system, it works like a pair of eyes, looking for potential hazards in the road ahead of you. It alerts and prompts you to take action and takes over applying the brakes if you don't. It includes Automatic emergency braking at city and highway speeds. There is lane keep assist, which helps to keep you within the lines of the road, and Lane Departure Warning in the Levorg, which alerts the driver with a sound when you are drifting out of the lines on the road. There is also Subaru’s Vision Assist technology, which includes blind spot monitor with light-up symbols in your wing-mirrors to alert you if anyone is in your blindspots. Rear cross traffic alert warns you of vehicles and pedestrians coming from the side especially when reversing. Lane change assist alerts you to fast approaching traffic behind you when you are changing lanes with a symbol on the dashboard. Other safety features are the auto-dimming rear view mirror and Auto High Beams, which dims your headlights for you automatically when approaching other vehicles. Some of these safety features drive me mad as a mum, with all their beeping and flashing, especially when I get my child to sleep and then one of the alarms wakes her up! I like to have all the safety features but be able to mute them when I have my child in the car! Which seven-seaters have the easiest third-row access? YAAAAAY!! Mazda now has Apple CarPlay and Android Auto! !